This weekend's Financial Times ran an article highlighting a new line of ETFs recently introduced by Barclays. The eight new ETFs offer investors an easy way to gain exposure to different areas of the fixed income markets, although we would warn that liquidity in most of these issues is lacking. 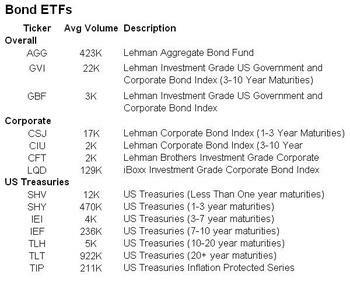 In the table below, we have highlighted the new and existing fixed income ETFs along with their average daily volume. This instrument is going to be very popular!